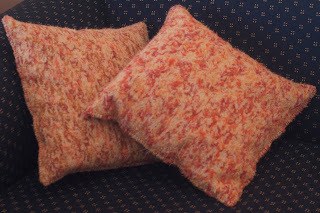 My daughter-in-law asked for some cushions for her birthday. She only mentioned it two weeks before her birthday but she was happy to wait a while. I then forgot to photograph them before I gave them to her and it's taken months for me to get photos - but here they are at last. 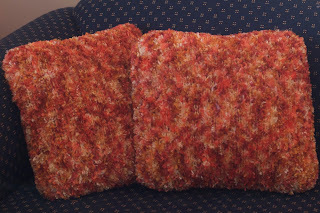 The two in the first photo are a plain yarn and a feathery yarn knitted together. These are knitted, needle-felted and machine embroidered. Lovely. Really rich autumn colours. I'm glad you finally managed to get photos of them.